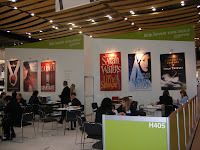 I sneaked a break away from my desk and enjoyed a day at the London Bookfair at Earl's Court. My first time at a Bookfair and what an eye-opener! Let me assure you these agents and publishers work like beavers. They earn their pound of flesh. The place was humming with industry. Downstairs were the publishers' stalls, but upstairs in the Rights enclosure there were hundreds of tables set out in rows where agents met up with publishers and foreign agents and scouts from all over the world. A non-stop schedule. If any of them had a voice left by the end of the three days, I'd be surprised. But it was fun too. My agent, Teresa, introduced me to a great bunch of foreign agents who deal with my books abroad. Lovely to put faces to names. The highlight was lunch with my wonderful American agent, Patty - a delicious Indian buffet within the hall. From there I moved on to tea and carrot cake with my UK Sphere publisher, Joanne. She got me on a high because of the preparations for the launch of my new book The Concubine's Secret (The Girl From Junchow in the USA). Publication day is 2nd July (2nd June in USA). Not long to go. By the end of the day I fell into the train, buzzing. Head full of plans, stomach full of food. Makes a change from banging my head on my desk all day! Can not wait to read this book! The sequel, THE CONCUBINE'S SECRET, will be in the stores Down Under at the beginning of July. Lydia rides again! I read Under A Blood Red Sky and was knocked out by it. I am now reading The Russian Concubine and cannot put it down. I think the way you get under the skin of your characters is remarkable and very rare. I will certainly buy your new book in July. Glad you enjoyed your day away at the Bookfair. I'm not saying anything you haven't already heard from hundreds of people, but I adored The Russian Concubine. Even after I finished reading it, the story and the characters never left my mind. You are a brilliant writer and I absolutely cannot wait for the sequel. Best wishes! Thanks for letting me know your response to Under a Blood Red Sky. I just love writing about Russia and feel the bond with that remarkable country grows stronger with each book. Now you know just how I feel! When I've lived with characters for about a year, it is hard to say goodbye to them. Like losing a beloved friend. So I really enjoyed spending time with Lydia again in the sequel - hope you enjoy it. Thanks for your comments. Ahhh finally the long awaited sequel has arrived. I can't wait!!! Though I'm going to have to go back and re read the first one, I have a horrible memory, lol. I'm sure this one will be just as good as the first one if not better. p.s. love both covers, looks great! Lovely to hear from fans of CONCUBINE. Enjoy the new one! Then spread the word.